This month marks the 50th anniversary of The Beatles' first visit to North America and their historic appearance on the Ed Sullivan Show, events that changed popular music and our wider society. As a fully paid up member of the Baby Boom generation, I remember that television appearance, but I also recall another television event featuring The Beatles that marked the maturation of a space age technology that also changed our lives and our world. This same technology also revolutionized the Olympics, making today's wall-to-wall coverage possible, regardless of where the games are staged. When the Fab Four first appeared on Ed Sullivan in 1964, the television signals were beamed from New York across the United States and Canada by microwave relays. The Beatles' many television appearances in the United Kingdom before that time could not be shown live in North America because the means didn't exist to move the signals across the Atlantic Ocean. Various ideas had been tried or were being tried to beam signals across oceans by bouncing the signals off of satellites. Giant balloons called Echo were put into orbit for this purpose, and one infamous U.S. Air Force experiment saw millions of needles put into orbit to see if signals would bounce off of them. Bouncing signals from satellites and needles didn't work very well, and so engineers and scientists decided to try satellites that amplified signals before beaming them to distant receiving stations on Earth. Telstar, immortalized in a 1962 instrumental hit by the Tornadoes, was an early trial of this technology. But Telstar flew in a low orbit that allowed only brief periods of signal transmission. Arthur C. Clarke, who later became famous as a science fiction author, had suggested putting satellites into geostationary orbit to facilitate communications. Such an orbit lies directly over the equator at an altitude of about 35,000 kilometres above the Earth. A satellite in such an orbit takes exactly one Earth day to circle the Earth, and hence the satellite appears to be stationary to an earthbound observer. This is a huge distance, however, and only the creation of the traveling wave tube and other advances made these satellites technically feasible. The first geostationary communications satellite, Syncom 3, was launched in August 1964, six months after The Beatles' first appearance on Ed Sullivan, and it was used to transmit live television of the 1964 Tokyo Summer Olympics from Japan to North America. The first geostationary communications satellite over the Atlantic Ocean, Intelsat I or Early Bird, was put into orbit in 1965. More of these geostationary satellites were launched over the next two years, and even the Soviet Union began to launch communications satellites, albeit into different types of orbits. In 1966, broadcasters from around the world, including Canada, the United States, Europe, the United Kingdom, Japan and Australia, agreed to broadcast the first worldwide television show using the then brand new geostationary communications satellite links, and months of planning and preparation began, involving thousands of people. Before the two-and-a-half hour show, called Our World, could be broadcast on Sunday, June 25, 1967, Soviet Bloc nations had pulled out of the broadcast as part of the political posturing following the Six-Day War in the Middle East earlier that month. In spite of this problem, the show went on the air, featuring live segments from around the world. Canada's contribution included a conversation between the CBC's Stanley Burke, the Peter Mansbridge of his day, and famed philosopher and communications theorist Marshall McLuhan. Another segment from the United States showed preparations for the first launch of the Saturn V rocket that would later propel Apollo astronauts to the Moon. But one segment from London, England, became the most memorable part of the show, which was watched by 150 million people in 26 countries. The Beatles performed a song specially composed for the show by John Lennon, "All You Need is Love." Joining the Beatles inside the studio was a full symphony orchestra and many friends of The Beatles, including The Rolling Stones, Eric Clapton, Keith Moon, Marianne Faithfull, and Graham Nash, who joined in the chorus of the song, which soon became a successful single release. The entire show was broadcast in black and white, but the Beatles segment was later colourized when it was shown years later on The Beatles Anthology. The segment is also memorable because of the psychedelic attire worn by The Beatles and their friends for this event, which took place early in 1967's "Summer of Love." Although appearances by The Beatles on live television were very rare by then, satellite television broadcasts from every corner of the Earth soon became commonplace, and thanks in part to Canadian advances in communications satellites, direct-to-home satellite services became part of everyday life in the late 1980s. Those satellite dishes are pointed at geostationary communications satellites. The Olympics grew exponentially because of satellite broadcasting. After the initial broadcasts from Tokyo in 1964, Olympic Games starting in 1968 were broadcast around the world as a matter of routine. Even though the Sochi Winter Olympics this month took place on the other side of the Earth, the broadcasts had the same quality and immediacy as the 2010 Winter Olympics that took place in our back yard in Vancouver, thanks in a large degree to satellite technology. The availability of satellite broadcast technology has changed our lives, and The Beatles and the Olympics all featured in the early history of this advance. 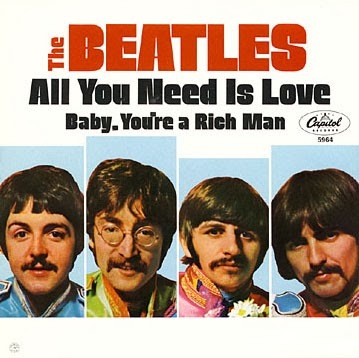 Whenever I hear that great Beatles anthem, "All You Need is Love," I think of the satellite technology that spawned it. Canadian astronaut Chris Hadfield's star turn as commander of the International Space Station in 2013 has deservedly attracted an unparalleled degree of attention, but his individual achievements also point to the fact that all of our Canadian astronauts are very special people. This was driven home to me again on the last day of January when Canadian astronaut Robert Thirsk came to Nanaimo to accept an honorary degree from Vancouver Island University. Thirsk was one of Canada's original astronauts, selected in 1983 and quickly chosen as Marc Garneau's backup for his historic first flight by a Canadian astronaut in October 1984. After the long hiatus caused by the loss of the shuttle Challenger, Thirsk finally flew aboard the shuttle Columbia for 17 days in 1996 in the STS-78 life sciences mission. The launch of the International Space Station in 1998 meant that American and Canadian astronauts would have to work closely with Russian cosmonauts. Thirsk became the first Canadian astronaut to be qualified to fly aboard the Russian Soyuz ferry craft, and in 2009, he became the first Canadian to fly aboard Soyuz to the ISS and back, and the first to get a long duration stay on the ISS, in his case six months. In Nanaimo, Thirsk spoke eloquently about how his views of Earth from orbit made him into an environmentalist. From space, the atmosphere that all life on our planet depends on is just a thin sheath. Increasingly, he said human activities are visible from space, and this underlines how human activities in one place can affect the environment on the other side of the Earth. Humans are becoming increasingly interdependent on many levels, Thirsk said, pointing not only to environmental and political activities, but to technological advances and changes in our financial system. A number of years ago, I saw Thirsk speaking about the topic of exploration. He told the story of a kayak journey he took retracing the footsteps of Sir Alexander Mackenzie, who in 1793 became the first European explorer to cross North America by land to reach the Pacific Ocean. Thirsk said his readings of Mackenzie's travels convinced him that Mackenzie possessed many attributes needed by explorers, including determination and leadership. If Mackenzie had lived today rather than in the 18th century, he would have made an excellent astronaut, Thirsk added. Thirsk has demonstrated his skill as an explorer, and so have other Canadian astronauts, including Hadfield and Garneau, who now is an active Member of Parliament. Roberta Bondar and Julie Payette blazed the trail into space for Canadian women, and Steve MacLean, Dave Williams and Bjarni Tryggvason have had impressive careers as astronauts and in their lives since leaving the astronaut corps. Thirsk, a medical doctor like Bondar and Williams, now has a leading role in directing Canadian medical research as vice president of the Canadian Institutes of Health Research. Today, Jeremy Hansen, a Canadian Forces pilot like Hadfield, and David Saint-Jacques, a physician and astrophysicist, are in training for their first flights after having joined Canada's astronaut corps in 2009. Like their predecessors, both have a long list of accomplishments even as they await a flight assignment. Ken Money, who was selected for the Canadian astronaut corps in 1983 but never got to fly in space, had established himself as a pioneer in research about the effects of space travel on the human body even before his astronaut training. Over the years, I have encountered people who fell just short of being selected for the Canadian astronaut program, and they have gone on to be top flight researchers in medicine and other sciences. Canadian astronauts, whether they are well known like Hadfield or not, are widely respected for their skills and judgement both inside and outside Canada's space program. They are all very special and accomplished people, even when you don't take their space flights into account. It was hard to determine whether the Harper government wanted to spread the word about the new space policy framework it unveiled on Friday, or hide it. Industry Minister James Moore announced the framework at a colourful event in the Canada Aviation and Space Museum, flanked by two Canadian astronauts in flight overalls, a class from a local elementary school, and a gaggle of officials headed by Walter Natynczyk, the new president of the Canadian Space Agency. The policy framework was published in a colourful booklet and online in a website containing videos of Canadian space achievements. Within minutes of the announcement, the Aerospace Industries Association of Canada issued its own release praising the framework for "strengthening the competitiveness" of Canada's space industry. But the announcement took place just as the Sochi Winter Olympics opening ceremony was about to begin, and on a morning that saw other and higher profile announcements from the Harper government. But most important was the content of the policy. The policy framework is notable for three things: It is long on generalities, short on specifics, and it follows very closely on policies that have been in place for decades. The policy framework emphasizes the importance of Canada's space industry to our economy and points to the use of the private sector for space initiatives whenever possible, messages that are totally consistent with the Harper government's stated goals. The Canadian space program has long been oriented in this direction. After Canada's first satellite, Alouette 1, was built in house by government scientists, the Diefenbaker government moved in 1963 to ensure that future satellites and other Canadian space assets be built by private contractors. In the five decades since that time, Canada's space program has focused on developing Canada's space industry above all else, and contracting out the lion's share of that work has consistently been the order of the day under both Liberal and Conservative governments, even after the Canadian Space Agency was established in 1989. The policy also stresses working together with other countries, which also is not new. Alouette, for example, was a part of a joint program with the United States, as was the Canadarm, and Canada has been a partner in the International Space Station since the beginning. Canada has also has a long history of cooperation with the European Space Agency and other space programs. The framework's goal of promoting Canadian innovation in areas such as space robotics follows on Canada's longstanding policy of developing expertise in "niche" areas such as communications satellite technology, remote imaging, and space robotics. Another goal of the framework involves "inspiring Canadians" with our space achievements. While the Canadarm and Canadarm2 have become such well-known symbols of Canadian excellence that Canadarm2 is now on our $5 bill, the CSA has often been criticized for the quality of its communications work. The framework's call for "Canadian interests first" reflects the space program's economic goals, and also the security and sovereignty concerns whose new prominence can be called the signature change made by the Harper government in space policy. There are few concrete measures in the framework that haven't been announced before, aside from $17 million in new money for the James Webb Space Telescope, the successor to Hubble, and even that is scarcely a surprise since the Canadian hardware for the new telescope has recently been built. Otherwise the framework, which was issued four days before a 2014 federal budget that will not likely contain relief from recent cutbacks to the Canadian space program, was silent on paying for any new initiatives. An announcement Moore made last December promising new committees to better coordinate multi-agency space efforts was contained in the framework, and this should assist Natynczyk in clearing up coordination problems that contributed to delays in the Radarsat Constellation program. 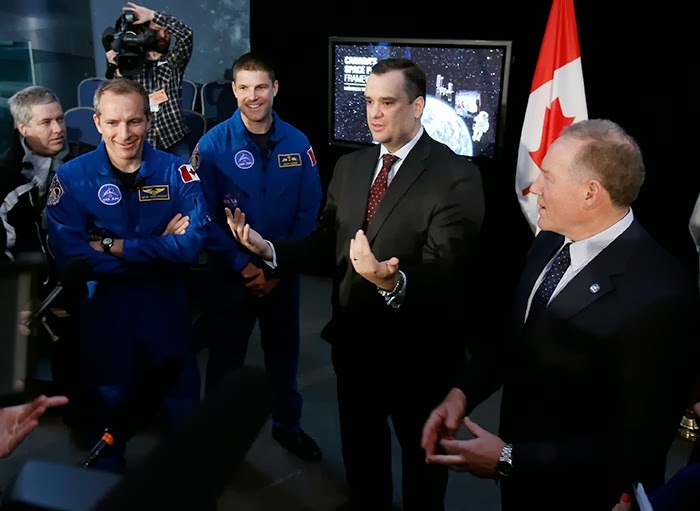 The presence of two Canadian astronauts, Jeremy Hansen and David Saint-Jacques, at Friday's announcement underlined the framework's provision that the Canadian astronaut program will continue into its fourth decade. With the U.S. space shuttle grounded, rides into space are few and far between, and hopefully this means that Hansen and Saint-Jacques will gain their first flight assignments in the not too distant future. The new Space Policy Framework, while welcome, provides very little new for our $3.3 billion space industry and the 8,000 high-tech jobs tied to it. Its ultimate effect will depend on the actions and details not announced on Friday, some of which will become clearer in the 2014 federal budget and hopefully in a long term space plan. The new space policy contains many reassuring words about the importance of Canada's space program and space industry, which suggests that the recent budget cutbacks may be coming to an end. But the words promise little more than a stand pat space program while the Harper government continues to put its highest economic priority on balancing its budget in 2015. 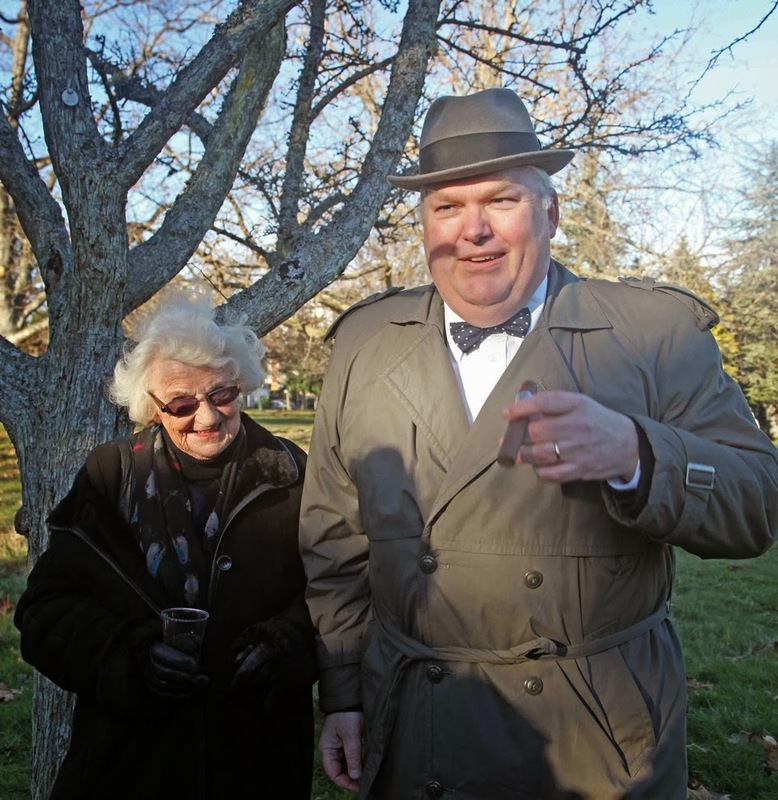 Chris Gainor dressed as Sir Winston Churchill in 2013. At left is Olive Bailey, who worked as a codebreaker during World War II at Britain's top secret facility at Bletchley Park. In my hometown of Victoria B.C., I am known for my public appearances dressed as Sir Winston Churchill, the incomparable British statesman who as prime minister faced down Adolf Hitler and his Nazi regime in World War II. My interest in Churchill was sparked by his central role in the history of the twentieth century, but over time I have become more interested in Churchill's interactions with new technologies. In his ninety years from 1874 to 1965, Churchill led an extraordinary life that encompassed many changes in warfare and technology. In 1898, he took part in the last great cavalry charge by the British Army, at Omdurman. His last major speech before he stepped down as prime minister in 1955 focused on his concerns about the hydrogen bomb. Churchill was known for promoting new technologies, including aircraft and tanks in World War I, and radar, computing devices to aid code breakers, nuclear weapons, artificial harbours and many other inventions in World War II. Indeed, Churchill was also known to champion many ideas that failed, such as making an aircraft carrier out of ice. In his role as a facilitator of technology, Churchill is one of the creators of today's world. In spite of the vast numbers of books that have been written about him, I have yet to see a good book on Churchill's relationship to technology. What about space exploration? Humanity's thrust into outer space began after Churchill retired in 1955, and so there is relatively little to say about him and the final frontier. Yet Churchill had a role in facilitating space flight when he brought Nazi Germany's rocket program to the attention of Josef Stalin, the Soviet dictator. In the summer of 1944, Churchill wrote Stalin about the German V-1 and V-2 missile programs and asked for permission for British experts to visit a former German rocket test range in Poland that had recently been taken by Soviet forces. Stalin responded by sending in a team of Soviet rocket experts, who found that the Germans had taken away most evidence of their rocket work before they surrendered the territories. In spite of this, the Russians were able to gather pieces of the V-1 and V-2 and associated equipment, including a V-2 combustion chamber, to take back to the Soviet Union. The Russians were astounded by the size of the V-2 rocket, and at the end of the war, Stalin ordered his rocket experts to build rockets like the V-2. The knowledge the Soviet experts gained, some of it with help from German engineers who went to work for them after the war, helped them build far bigger rockets after Stalin's death, rockets capable of launching nuclear warheads to the United States and satellites and spacecraft into orbit and beyond. As for the British, their experts were allowed into the test range, but only after the Soviet team had done its work. Churchill left 10 Downing Street after an election defeat as the war was ending in 1945, but he returned as prime minister in 1951 and served until his retirement in 1955. During this time, both the Soviet Union and the United States armed themselves with nuclear weapons, and the cold war between them was widening. While Churchill was preoccupied with mediating the differences between the two superpowers, his government was also creating Britain's own nuclear deterrent. This included a decision to develop an intermediate range ballistic missile that became known as Blue Streak. In 1960, long after Churchill left office but before the missile was completed, Blue Streak was cancelled. The second Churchill government's work on Blue Streak led to two short-lived British space efforts. Blue Streak was used as the first stage for the multinational Europa launcher, which itself was cancelled in the early 1970s, and an associated program, Black Knight, led to a rocket that launched a British satellite in 1971. "Let no one believe that the lunar rockets, of which we read in the press, are merely ingenious bits of prestige. They are manifestations of a formidable advance in technology. As with many vehicles of pure research, their immediate uses may not be apparent. But I do not doubt that they will ultimately reap a rich harvest for those who have the imagination and power to develop them and to probe ever more deeply into the mysteries of the universe in which we live."